This is my take on Beer Can Chicken but with an Irish Guinnessy twist. The principle behind the idea is that the beer can heats during cooking which in turn steams the chicken from the inside ensuring a perfectly moist and succulent bird. The process also produces a wonderful Guinness based gravy from the juices released by the chicken mixed with the Guinness. Rustic, tasty food that can feed a crowd for little expense. I cooked the chicken on the BBQ but if this isn't convenient an oven will do nearly as good a job. Open the can of Guinness and pour half out for the sauce and keep for later. 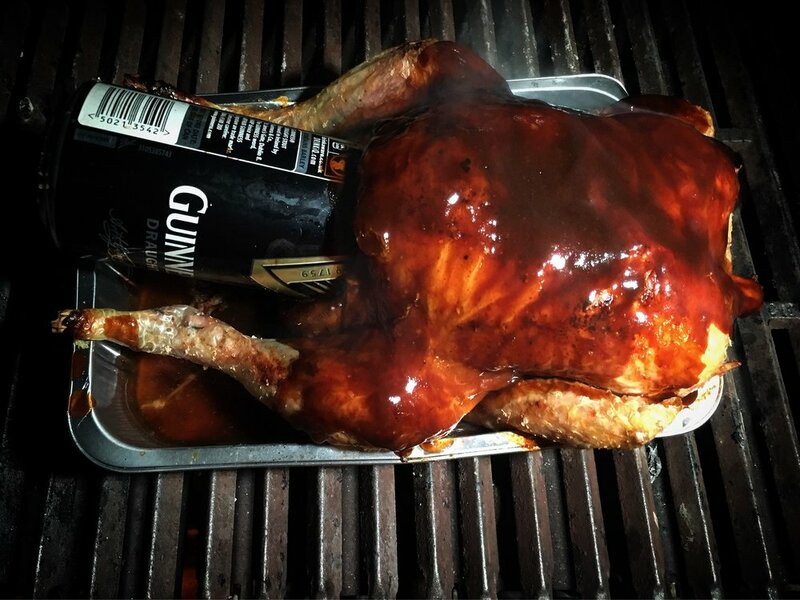 Stick the can of Guinness into the cavity and place the chicken back into A foil tray or roasting dish. Once your oven or BBQ has come up to temp (180º) insert the chicken and set a timer for the recommended cooking time. As the chicken is cooking it's time to prep the spuds. I cut the Maris Pipers into small cubes and power boiled for around 6-7 minutes to soften slightly. Heat your fat of choice, I used Pat Whelan's award winning Beef Dripping, until piping hot. Drain the potatoes and leave to sit for 10 minutes until they have stopped steaming. Next place them in the hot fat along with the whole garlic cloves and chilli flakes then into the oven/BBQ for 45 minutes. When the chicken is around 20 minutes from being removed from the heat start preparing the glaze. Add the remaining half of the Guinness to a pan along with the soy, chilli sauce, BBQ sauce and salt. Bring to the boil then reduce the heat to a light simmer until slightly reduced. Once the glaze has reduced and the chicken is 5 minutes away pour over the chicken and roast for 5 last minutes. Remove the chicken after the designated cooking time and set aside to rest for 5 minutes. There should be a significant amount of gravy at the bottom of the cooking tray. Be sure not to throw this out, instead pour into a pan and skim most of the fat from the surface. As before with the glaze reduce until a semi-thick consistency where the sauce coats the back of a spoon. While the sauce is reducing remove the potatoes from the oven and place on some kitchen roll to absorb the excess fat. Remove the garlic cloves and mix in the finely grated parmesan. I cut the chicken into roughly chopped pieces with the bones still in. Pour over the sauce and serve with the Chilli Parmesan potatoes.